Apple's premium strategy for eliciting interest among smartphone buyers will have to continue to depend on jaw-dropping technology to make iPhones attractive because the commodity volume leaders are all in a race to the bottom in a market where prices are plummeting and growth has disappeared. Sound familiar? It's like the second coming of the PC. Estimates by Strategy Analytics show that Samsung's smartphone sales fell 4 percent YoY on shipments of 74.4 million units, giving it 18.6 percent market share globally in calendar Q4 2017. The firm noted that this performance was "up slightly from 18 percent share a year ago," when the company was in full panic mode during the peak of its Galaxy Note 7 fire season. 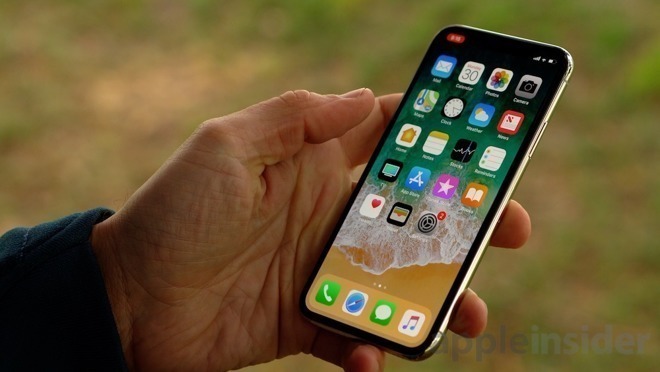 Apple's total sales of iPhones in the quarter reached 77.3 million, nearly 4 percent higher than Samsung's despite the introduction of a trio of the most expensive tier of new flagship iPhones ever. That's particularly noteworthy because Apple's iPhone 8, 8 Plus and X models pushed the company's ASP within five bucks of $800 while selling against Samsung handsets offered at an ASP of less than $250. On top of Apple besting Samsung not just in profits (as it always has) but even in volumes of smartphones shipped during the holiday quarter, Apple was also facing a bleak global market for smartphones. The holiday quarter was "the biggest annual fall in smartphone history"
"Global smartphone shipments declined 9 percent annually from 438.7 million units in Q4 2016 to 400.2 million in Q4 2017," the firm reported, referring to the drop as "the biggest annual fall in smartphone history." Strategy Analytics blamed the drop on "a collapse in the huge China market, where demand fell 16 percent annually due to longer replacement rates, fewer operator subsidies and a general lack of wow models." Across all of 2017, global smartphone shipments were estimated to have grown just 1 percent, reaching a record 1.5 billion units. However, it's clear that Chinese makers who had been posting huge shipment gains of cheap commodity handsets are no longer going to be able to continue to do so in a climate of such stagnant saturation. At the same time, Apple's stand-out, premium-priced iPhone X was, in fact, the company's best selling model every week it was on sale during the quarter. Incessant reports of iPhone X experiencing "weak demand" due to its price, as Tripp Mickle claimed in his thin, poorly researched article for the Wall Street Journal, were totally wrong. 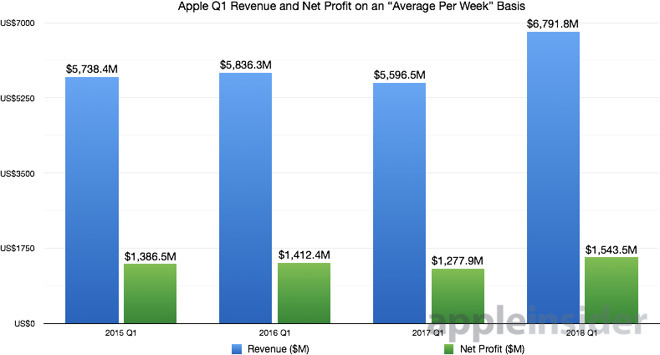 On a weekly basis, as Mike Wuerthele and Malcolm Owen wrote this morning iPhones sold in the latest holiday quarter generated more than a billion dollars per week more in revenue compared to the previous year. However, because last year's reporting quarter was an extra week longer than this year's, Apple's sales in the quarter "fell" 1 percent YoY over the arbitrary reporting period. The difference in time between 13 weeks and 14 weeks is nearly 7.7 percent, so citing the two numbers without noting that is like comparing an athlete's time running a 400 meter dash with the time needed to run 430 meters, and suggesting that any difference in the actual number of seconds means the performance was "disappointingly slower," even if the runner was actually running at a faster pace. Strategy Analytics Executive Director Neil Mawston was among those who ignored this, describing Apple's performance only as "slipping 1 percent annually." He added that "iPhone volumes have actually declined on an annual basis for 5 of the past 8 quarters," and added, "If Apple wants to expand shipment volumes in the future, it will need to launch a new wave of cheaper iPhones and start to push down, not up, the pricing curve." At the same time, he also noted that "Samsung dipped 4 percent annually [in Q4]," despite selling phones with an ASP that is now less than a third of the average of Apple's entire iPhone lineup (including its new, lowest-ever priced iPhone SE). Samsung has a vast selection of cheap phones that didn't prevent a decrease from occurring, and its drop resulted over 4 million fewer sales, versus 1 million fewer iPhones YoY on the same quarterly basis. Lower prices helped Samsung to expand unit shipment volumes slightly across the entire year; its total sales for 2017 reached an estimated 317.5M, compared to 215.8M iPhones sold by Apple. But as Mawston also noted, "Samsung is under pressure from Chinese rivals in some major markets, like China and India." And unlike Apple, Samsung doesn't have an iPhone X to effectively "push up the pricing curve." In fact, Samsung was forced to slash the price of its premium flagship in the quarter. Chinese manufacturers have issues of their own. Strategy Analytics noted that Huawei sales slipped 8 percent in the quarter YoY while facing an inability to enter the U.S. market related to fears that it's trying to sneak in Chinese spyware. OPPO, the low-end brand of BKK Electronics, has previously been heralded for huge volume increases of phone shipments globally, but it's now flatlined. Strategy Analytics estimated that OPPO shipments remained flat at exactly 29.5M units, the same as the previous year-ago quarter. Xiaomi "soared 87 percent annually," but that was on sales of just 27.8M units in the winter quarter. The firm noted, "Xiaomi is outgrowing almost everyone for now, but we expect its breakneck speed to slow this year, as rivals such as Huawei fight back with improved or cheaper new designs." Other brands in China (which would include BKK's formerly fast-growing Vivo and OnePlus brands) collectively tanked by over 22 percent, with total shipments falling from 193.6M in the year-ago holiday quarter when iPhone 7 debuted, to just 150.2M in the most recent holiday quarter. Another problem for cheap commodity phone vendors is that while they can "grow" in the short term by offering cheap models, their repurchase loyalty rate is half that of iPhone buyers. So regardless of how long the buying cycle is, it is only half as likely to ever benefit them. The current quarter ending in March includes China's Lunar New Year festival, a gift-giving season that has previously bumped up Apple's performance. This year, however, Apple's guidance appears to express a conservative anticipation of an increasingly difficult competitive environment in China. For Apple to be price-competitive with Chinese Androids, it too would have to begin selling low-end iPhones at cost, a practice the Chinese government is unlikely to want to subsidize, given that Apple is an American company. Further, given Apple's profitably in an overall market rife with cheap commodity, it's hard to see why Apple would want to join Chinese companies in failure rather than remain the leader in sustainable profitability. Besting Samsung in volume too ... just wow. That is really impressive, especially given the fact Apple doesn't compete in the low end market. And yet the stock is still falling. Since Apple doesn’t provide sales by model how do we know this? Why should I trust “estimates by Strategy Analytics”? Also Apple and Samsung don’t release flagship phones at the same time so isn’t it kind of hard to compare? Will “estimates by Strategy Analytics” show iPhone X beating out Samsung a month or two after the Galaxy S9 is released? Thanks for pointing out the WSJ & MSM lies. I never liked that Tripp guy. Analysts don't understand Apple. Units don't pay the bills, profits do. Well now Apple has both. And everyone is forgetting that Samsung makes a ton of money off of the OLED displays in the X. They are probably crying all the way to the bank. Maybe to get more unit sales Apple should Sell a new FlagShip phone with a headphone jack. If all you have left is “But Samsung makes components for iPhones!” then you’ve completelydia lost. You are no longer a soldier in the Samsung & Apple smartphone wars. We aren’t talking about Samsung’s parent companies, we’re talking Samsung mobile, as a smartphone brand. Apple doesnt need more unit sales, and the legacy headphone port is not coming back, get over it. Nobody forgot it; it just isn’t relevant. They outsold phones that have headphone jacks, so not having one clearly isn’t a problem. What d’you reckon? Maybe a parallel printer port would save them. In this instance, it's necessary to be pedantic (I'm sorry). They outsold 'models'. 'Phones' with headphone jacks still reign. I know you meant 'models' anyway but the point is relevant because Samsung has so many different handset versions on the market at the same time. Apple sells lots of a few models whereas Samsung sell lots of many models. That's why Huawei had no models in the top 10 Chinese list a short while ago but still sold more phones than Apple. That's a given. Apple does mind blowingly well AAPL falls. Apple does less well AAPL falls. The good news is over the long run AAPL keeps going and going .... you have to look at the overall years not the months. Just ignore the blips caused by Wall Street manipulations. No, this conversation was about Samsung and Apple. And Apple sold more smartphones than Samsung did during the last quarter. The people have spoken — legacy headphone port doesn’t matter. k2’s suggestion is nonsense. "And Apple sold more smartphones than Samsung did during the last quarter"
"Estimates by Strategy Analytics showthat Samsung's smartphone sales fell 4 percent YoY"
Are we talking about factual sales or estimates? Shouldn't we expect, if not an apology, at least a disclaimer, from all of those "experts" and bloggers who claimed that "market share" was the only metric that mattered? Not just Apple. They don't understand any business, if they do not get this. Shorter post; Apple's business model is not fricking fair! Samsung and Huawei are doing it wrong; that's what revenue and profit share of smartphones has determined. In truth, it's all that is left for the Android OS business model; fighting over a greater share of less valuable customers, and hoping to make it up with premium sales. But Samsung is learning! The S9 is expected to be a higher price point than the S8!